With more and more people buying holiday homes abroad, pets are packing their bags and joining their owners! The pet travel scheme (PETS) has made this easier but it’s not quite that simple. Why do Animals Need to go into Quarantine? Why is Rabies Such a Threat? This disease can affect all warm-blooded creatures, including people. Rabies is an acute infectious viral disease. It attacks the nervous system. Rabies can be spread through saliva - especially by bites from infected dogs. The UK is one of 30 countries classified as rabies free. 40-70,000 people die from rabies each year. These are some of the reasons why correct quarantine procedures are so important. People who work in quarantine kennels are mainly qualified vets and veterinary nurses who take the welfare of animals in their care (and those that are not) very seriously. Every animal must have an up to date immunisation record, a permanent microchip implant, vaccination against rabies and relevant blood tests. Vets will also need evidence that animals have been treated for ticks and tapeworms 24 to 48 hours prior to the start of their return journey to the UK. Owners must sign a declaration to state that their pets have not been outside any PETS countries in the previous six months. If for any reason, animals do not meet the requirements for re-entry, they are returned to the country of origin or quarantined; without exception. Quarantine kennels are, necessarily, run under very strict rules. Daily veterinary checks are made on the animals, there is a surgery on site and often, an animal hospital nearby. Kennels are disinfected and prepared for each new animal in advance. 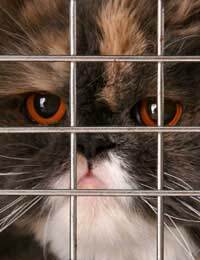 Quarantine kennels usually expect notice of 7 days for animals that are being imported and must go into quarantine. Flights/ferry times are given in advance too, as well as size and dimensions of the animal’s travelling kennel. This is so the right size vehicle is sent from the quarantine kennels to collect the animal or animals. Accurate record keeping is crucial to the efficiency of quarantine. Veterinary nurses, vets and any visitors sign in and out of the premises, every time. It is important to know who has been to the quarantine kennels and when. Records of all animals, veterinary checks and so on, are strictly regulated. If there is any cause for concern (possible infection) then every person and animal can be traced and appropriate action taken. The routine care of animals in these kennels is not dissimilar to that of ordinary boarding kennels. Dogs and cats still need a place to sleep, a run to exercise in, food and attention! The difference is each animal, no matter how young, cute or cuddly, has to be regarded as a potential disease carrier while in quarantine. Routine grooming and clipping can be carried out. Kennel staff here may not form such close bonds with the animals as they would in boarding kennels, because they do not have such a high level of inter-action with them. Sometimes, though, because the animals are there for so long, staff can get very attached to them and the animals to their carers - especially if the owners don’t visit very often! After they have signed in at the office, a member of staff will issue visitors with a bell or whistle. They are led to their pet’s enclosed unit and locked in with it. (The whistle or bell is for them to use in an emergency.) Owners are not allowed to touch any animal but their own and although they may be permitted to feed their own pets they must not feed any others. Working in quarantine kennels requires a mature and responsible attitude to animal (and human) welfare. Qualifications are necessary because of the responsibility of the work, although unqualified but experienced general kennel staff may sometimes be employed. Veterinary nurses, kennel maids and other members of staff must be vigilant and self-disciplined. The work is interesting and varied, but there is also an element of danger. Without quarantine kennels the threat to us and our pets would be much greater.